INNOSOL Lucia Mega Bright Light is a very powerful, yet beautifully designed light therapy device suitable for the treatment of Seasonal Affective Disorder (SAD). Can be used free standing on a table or floor and can even be wall mounted to create an attractive light fixture with all the benefits of a SAD light therapy lamp. This powerful lamp performs effective light therapy treatment from a distance of over 1 metre and includes a dimmer for finer control. Bulbs Included. Long-range therapy distance - Effective light therapy from over a metre away. Features a dimmer switch for adjustable levels of light. World class design results in a very aesthetically pleasing light. 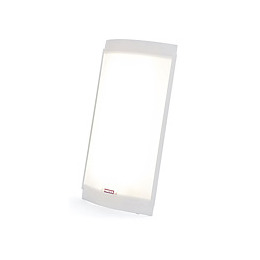 Below are reviews of INNOSOL Lucia Mega Bright Light - 55W SAD Light Therapy by bodykind customers. If you have tried this product we'd love to hear what you think so please leave a review. INNOSOL Lucia Mega Bright Light is a very powerful, yet beautifully designed light therapy device suitable for the treatment of Seasonal Affective Disorder (SAD). This is the more powerful version of INNOSOL Lucia Bright Light and includes a dimmer.